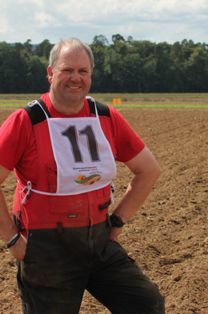 See http://www.ploughmen.co.uk/results/european-ploughing-championships for the results of the 2019 European Reversible Ploughing Championships. Ploughing seminar due to be held on 17th March has been cancelled due to weather. We had a very friendly and enjoyable AGM yesterday. 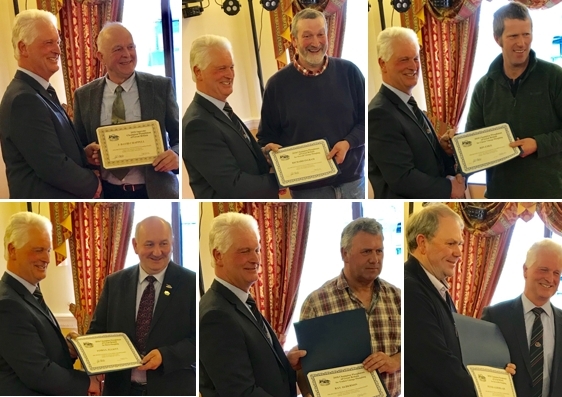 Pictured with Chairman John Hill below are some of the 2018 Champions (clockwise from top left): David Chappell, Richard Ingram, Jon Cole, Peter Alderslade, Ray Alderson, Jim Elliott. Pictured on the right are Vice Chairman Viv Samuel, Chairman John Hill and Chief Executive, Sue Frith. The latest newsletter should be with all our members in the next few days. Unfortunately, due to unforeseen circumstances, the seminar planned for 23rd February at Oswestry has been cancelled. Click the following link for some excellent photographs from the 2018 British National Ploughing Championships: https://carolstevensraycasse.photoshelter.com/gallery/British-National-Ploughing-Championships-2018/G0000JbQhpbakrrU/. Nigel Vickers has won the conventional section in the 2018 Five Nations Ploughing Challenge held in Northern Ireland. Billy Purkiss 4th in the reversible. Well done both! Newsletters should be with all our members in the next few days. England Ploughmen - Mick Chappell and Ashley Boyles - set off to the World Ploughing Contest taking place in Germany on 1st & 2nd September. Congratulations to Ian Simms from Northern Ireland, overall winner of the European Vintage Ploughing Championships in Belgium. Well done to all the other competitors in tough conditions - John Milnes (2nd trailing vintage); Jon Cole (3rd classic vintage) and Colin Hewetson (4th vintage hydraulic). Congratulations to Liam O'Driscoll from the Republic of Ireland, winner of the European Reversible Ploughing Championships in Russia. Well done to all the other competitors in 34 degree heat - it was tough going for Robert and Peter who both had huge time penalties on the first day, finishing 13th and 15th respectively overall. A reminder to all ploughmen and women that entries close for the National on 30 June. Forget about the World Cup in Russia! Our ploughmen are on their way to Suzdal, Russia to take part in the the 2018 European Reversible Ploughing Championships next weekend (23rd & 24th June). Good luck to Peter Alderslade and Robert Snowdon. We are delighted that BRIDGESTONE/FIRESTONE will again be a main sponsor of the British National Ploughing Championships. Unfortunately we have had to cancel our Ploughing Seminar at Edenbridge, Kent on 31st March due to wet ground conditions. Unfortunately we are unable to re-arrange it this spring. Unfortunately ploughing matches are being cancelled or postponed throughout the country due to severe wet conditions at the moment. Keep an eye on our UK Matches page for any updates. At the 2018 AGM, we presented certificates to the 2017 National Champions who were able to be there. Pictured below is Chairman John Hill, presenting certificates to - Mick Chappell (Reversible Champion); John Milnes (Overall Vintage & Trailed Vintage Champion); Jim Elliott (Horse Ploughing Champion); Richard Ingram (Vintage Hydraulic Champion) and Derek Needham (High Cut Champion). Unfortunately we have had to cancel our Ploughing Seminar at East Boldon, Tyne & Wear on 10th March due to severe weather conditions. Hopefully we will be able to re-arrange this at a later date. Yesterday we held our first Ploughing Seminar of the year at North Petherton, Somerset. It was a great day, weather was fine and enjoyed by all. We are still taking bookings for the next ones - Saturday 25th February at Hockley, Essex; Saturday 10th March at East Boldon, Tyne & Wear and Saturday 31st March at Edenbridge, Kent. Our Spring newsletter has just been sent out to all our members. Membership is due for the current year - the latest newsletter will be on it's way to members very soon. There's a slight change to the address of the site for the 2018 British National Ploughing Championships than originally advertised. The address is Austrey, near Atherstone, Warwickshire, CV9 3ED. The date is 13th & 14th October. 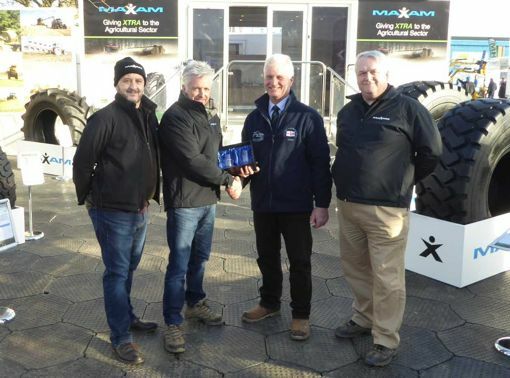 We're delighted to welcome Maxam Tire as a sponsor of the British National Ploughing Championships. Pictured at the LAMMA show are (from left to right) Kevin Buckley (Key Accounts Director, Maxam Tire), Martin West (President, Maxam Tire), John Hill (Chairman, SOP), Mark Turner (Senior Product Marketing Manager, Maxam Tire). Society of Ploughmen director, David Chappell has launched #PloughForLife to raise funds for Breast Cancer Research. He has painted his plough pink and will be fundraising and raising awareness at ploughing matches and shows throughout the year. His tractor and plough will be at the LAMMA show at Peterborough this week on the Maxam Tyres stand. Four Ploughing Seminars will take place this spring for judges and ploughmen, experienced or novice. Click on the ACADEMY tab at the top of the page for further details. Results are in from the 64th World Ploughing Contest in Kenya. 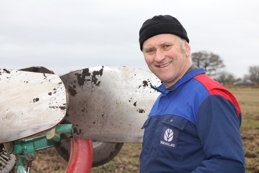 Ian Brewer won the trophy for best ploughing by a competitor ploughing in a World contest for the first time. Click on the RESULTS tab at the top of the page for the full results. Full results are available from the 2017 British National Ploughing Championships. Click on the RESULTS tab at the top of the page for results and photos. Taunton, Somerset on 14th & 15th October. Like us and share the photographs - look for SocietyofPloughmen. place in his class. After the disappointment of cancelling ploughing on day one due to the weather, the second day went ahead as planned. Go to our RESULTS tab to see the results. 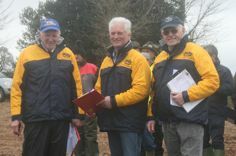 Our ploughmen, over there ready to compete with many other nations are Jon Cole and Ray Alderson, pictured below with coach/judge John Harris.